Summer food around here is all about being fresh, flavorful, and light. Homemade salsas definitely fit that category, and we’ve been eating lots of it! Have you tried making your own salsa yet? It is so easy. As you can tell by the instructions below, there are only two steps. One of those steps being refrigerate the salsa. A great aspect of making your own salsa is that it allows for control on how much heat you want to meet everyone’s tastes. I’m not a huge fan of a lot of spice, so I really like fruit salsas. 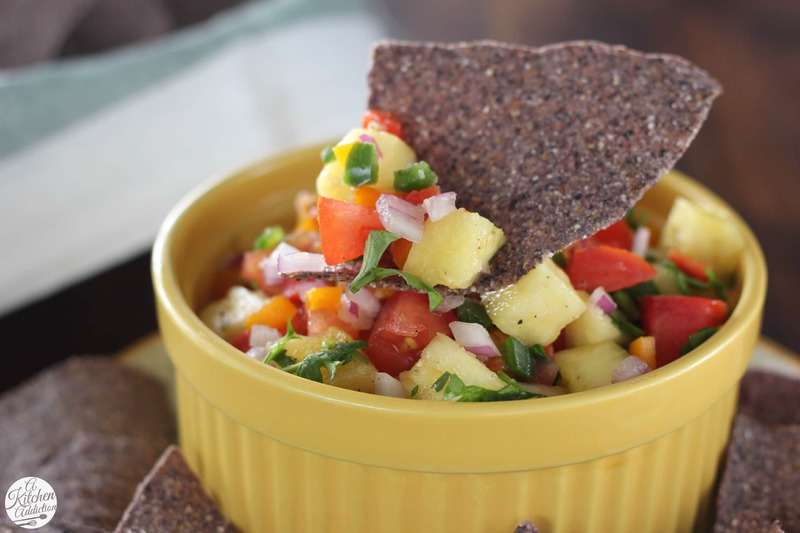 The most recent being this fresh pineapple salsa. 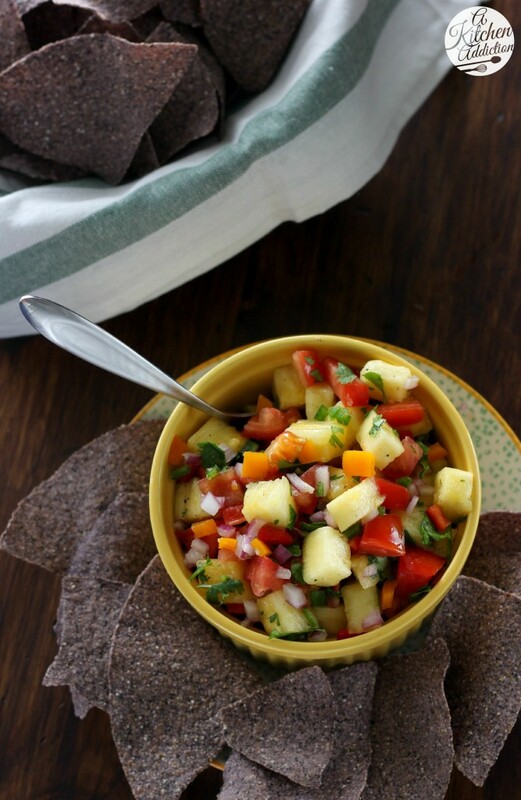 A fresh, flavorful salsa that is the perfect balance of sweet and spicy. The heat from the jalapeños evens out the sweetness of the pineapple. Red onions and fresh lime juice also pack a lot of flavor into the dish. We like the flavor of cilantro, so I made sure to add some to this salsa. If you aren’t a fan, you can easily leave it out. Just mix and match the flavors and quantities to your liking! 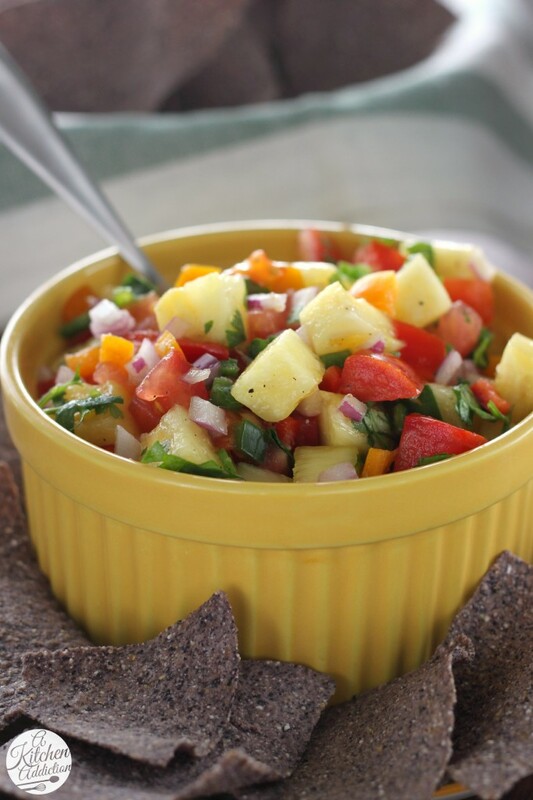 Make up a big batch this weekend to serve with your favorite tortilla chips or grilled meat for a fresh summer side! While you can eat it right away, I strongly recommend that you let it refrigerate for the stated 2 hours. The flavors really start to blend and make the salsa that much better! Gently mix together all ingredients until combined. Refrigerate for at least 2 hours to allow flavors to blend. Serve. I love salsa with fruit it in! It adds so much flavor! Yes to making salsa at home! I’ve been making them like crazy these last few weeks! This pineapple one looks wonderful! I love fruit salsa! This looks really good! Pinned! Yum! 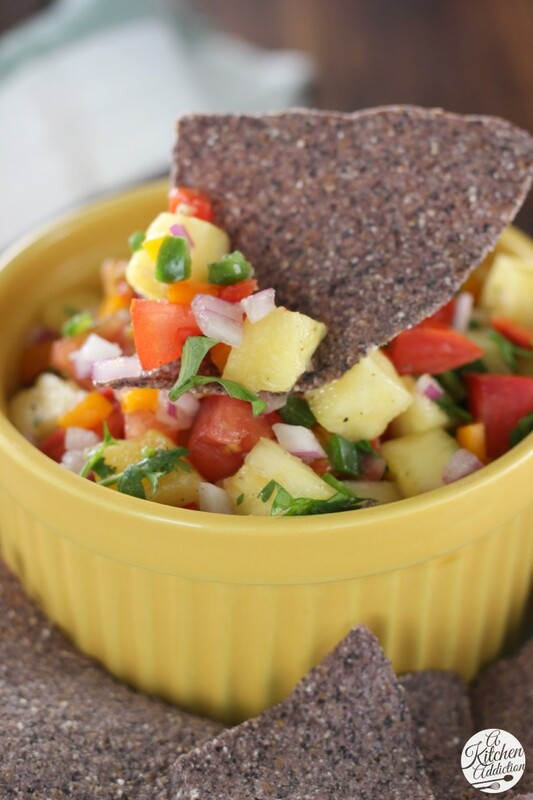 I love pineapple salsa! Yours looks perfect! So fresh and delicious! Homemade salsas are the best! The perfect weekend meal for me would be a bowl of this salsa, some chips, and a refreshing cocktail! I am obsessed with pineapple and always love finding new recipes. This salsa would be great with chips or on tacos. Oh I would seriously eat this with a spoon! Looks and sounds delicious, especially with addition of pineapple – I had never thought of that before! Yum. Such a fabulous salsa—I’d have to keep myself from eating it all with spoon!!! YUM! Recipe perfection in my mind! I love salsas with fruit in it like this one. It adds such tremendous flavor and sweetness. This salsa is screaming my name! My hubby makes something similar and it’s a huge favorite around our house. We’ll have to try your version next time- it looks amazing! Since it’s summertime, I always like to have light/refreshing lunch & dinner options. This salsa will definitely be in heavy rotation in my house. Thanks Jessica for the recipe.